Tai Chi helps dad overcome trauma of living with a heart condition that left him in a coma | News by Wales Express News, People Before Profit! A dad-of-three who survived two cardiac arrests including one that left him in a coma for six days is rebuilding his life with the help of the ancient martial art, Tai Chi. Music teacher Paul Williams, 37, from Bagillt, in Flintshire, attends free classes run by social enterprise RCS (Rhyl City Strategy) in Rhyl, after learning he has a rare heart condition could strike again at any moment. Paul says Tai Chi, which combines deep breathing and relaxation with flowing movements, is helping him overcome severe anxiety and Post Traumatic Stress Disorder (PTSD) brought on by the trauma of living with his condition. 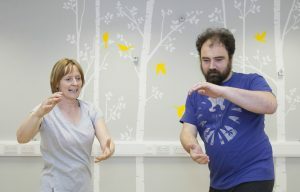 He found out about the RCS classes after meeting Tai Chi instructor Sue Edwards through his NHS rehabilitation sessions. Paul said: “It’s been amazing. As well as the physical side of things the Tai Chi is slowing down the mental side of things. It’s helping me to take the focus away from my fears. “My mind ran away with me. PTSD changes everything. It was pretty harrowing. “Focusing on the specific movements and postures is really anchoring. You come out and it’s like you’ve had a good sleep. According to Paul, he has even started to regain memories lost due to his cardiac arrest attack and coma, as a result of practising Tai Chi through RCS. Paul had no idea that he had a heart problem until he suddenly collapsed as he finished a day of teaching at Abbey Gate College in Chester, at age 35 in November 2015. His life was saved thanks to quick thinking colleagues who used the school’s defibrillator to re-start his heart, and called for an ambulance. Doctors kept him in an induced coma for six days, and hospital tests revealed he had been born with Brugada Syndrome, a rare condition which can disrupt of the heart’s normal rhythm and cause Sudden Adult Death (SAD) without warning. Paul now has had an Implantable Cardiac Defibrillator (ICD) fitted inside his chest, which has been carefully calibrated to shock him if a cardiac arrest should strike again. But the stress and trauma of his condition left him fearful of going out alone, or being left alone with his children Evie, 12, Faye 10, and Iris, aged one. He has been unable to work since the attack and his wife Gemma, 36, has also had to give up her career to become his full-time carer. The couple celebrated the birth of their third child Iris last summer, just ten weeks before Paul suffered a suffered a second cardiac arrest in September 2017. Though traumatic, the incident spurred Paul on and now he is determined to improve his health so he can be strong for his young family, and someday get back to work. He still suffers from nightmares and flashbacks to the coma, but says the Tai Chi is helping him to cope with the anxiety that the condition could strike again at any time. “I shouldn’t be here,” said Paul. “It’s very, very hard to put into words how I feel, it was such a severe thing to happen. “I have very much been living in fear that it can happen again. It’s a scary thing to keep thinking that, it’s like a black cloud. RCS has been delivering the free Tai Chi classes at their headquarters in West Rhyl to encourage and inspire people to try new forms of exercise as a way of improving wellbeing. A total of 56 people have tried out Tai Chi, yoga or pilates in the past year. Also in the class with Paul are 89-year-old Gwen Morgan who will celebrate her 90th birthday in August, and Valerie Chilton, 70, both of Kinmel Bay. Operational Director at RCS Alison Thomas, said: “Paul has had an incredible journey. It’s inspiring to hear about the change in him since he’s starting the Tai Chi classes. 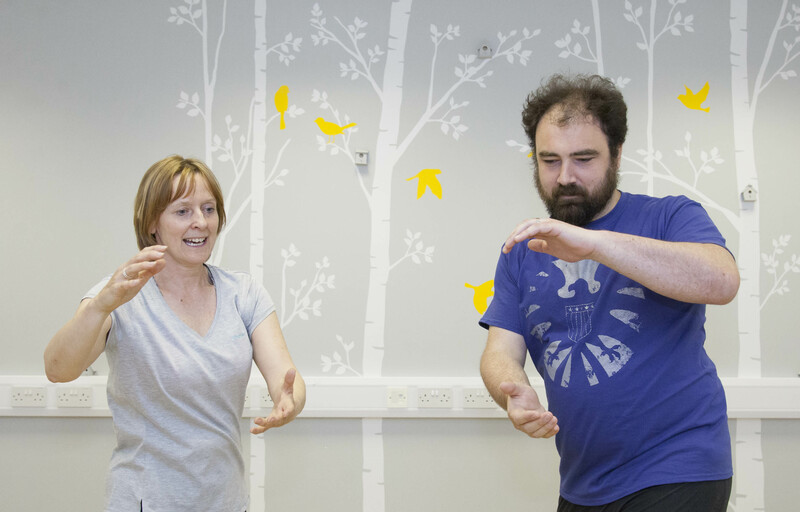 The Tai Chi classes at RCS are run by former nurse Sue Edwards, who became a wellbeing trainer after leaving her role in the NHS, and is on a mission to promote more proactive approaches to health. Sue said: “We’re practising a form of Tai Chi called Shibashi at RCS which is very low impact and suitable for beginners. Newport set to get geeked!